A vacuum as described by quantum mechanics is perhaps the most fundamental but mysterious state in physics. The discovery of correlations between electric-field fluctuations in such a vacuum represents a major advance. Andrey S. Moskalenko is in the Department of Physics, Korea Advanced Institute of Science and Technology, Daejeon 34141, South Korea, and in the Department of Physics, University of Konstanz, Germany. Timothy C. Ralph is at the School of Mathematics and Physics, The University of Queensland, St Lucia, Queensland 4072, Australia. One way to measure correlations in fields is through interference, such as in the double-slit experiment of British physicist Thomas Young3. In this experiment, light waves pass through two slits and interfere with each other to produce an interference pattern on a screen. This simple, but profound, experiment was originally developed to probe wave effects and was later used to illuminate the duality between particles and waves in quantum physics. In the past, variations of the double-slit experiment have been realized for photons, electrons, atoms and large molecules4. Current attempts are even looking for multipath interferences for biological objects, such as viruses5. A comparably counter-intuitive enterprise is to search for interferences between separated parts of a vacuum. Benea-Chelmus and colleagues devoted their experimental study to exactly this task. For a simple, conceptual physical explanation of their work, consider a version of the double-slit experiment that is based on an instrument called a Mach–Zehnder interferometer6 (Fig. 1a). Moreover, let us limit the discussion to temporal correlations and consider the case in which thermal radiation is incident on the interferometer. Figure 1 | Standard and modified Mach–Zehnder interferometers. a, In a Mach–Zehnder interferometer, thermal radiation from a radiation source is split into two parts by a beam splitter. Each part is directed by a mirror through a second beam splitter and into a detector. A device called a delay line introduces a time delay in the propagation of one part with respect to the other. This set-up can be used to study the correlation properties of the radiation. b, Benea-Chelmus et al.2 report an experiment that can be thought of as a modified Mach–Zehnder interferometer. The radiation and its source are replaced by the electric field associated with a vacuum, and the delay line is substituted with two elements called temporal gates that ‘observe’ electric fields in ultrashort time windows — the two observations differ by a time delay. Specialized detectors analyse the observed signals. The authors used their experiment to measure correlations between electric-field fluctuations in the vacuum. In this set-up, the radiation is divided into two equal parts by a beam splitter. The two parts propagate in their own ‘arms’ of the interferometer before passing through a second beam splitter and being collected by two detectors. In one of the arms, there is a device called a delay line, which introduces a variable time delay in the propagation of one part with respect to the other. The correlation properties of the radiation can be determined from the variation in the intensity measured by either of the detectors as a function of the time delay. A perfect interference pattern (one that is at its maximum visibility) is observed if the intensity oscillates between a certain maximum value and zero. Even though thermal radiation is completely chaotic, an almost perfect interference pattern can be seen in such a set-up for small time delays. However, when the time delay becomes larger than a temperature-dependent quantity called the coherence time, the amplitude of the oscillations with respect to the maximum value quickly decays and the minimum value is no longer zero. Benea-Chelmus et al. observed this behaviour in their experiment at about room temperature (300 kelvin) and found that the coherence time agreed with theoretical predictions. If the temperature is lowered to a few kelvin, radiation in the terahertz frequency range, which is relevant to such experiments, is suppressed. For example, at 4 K, there are effectively no photons that have frequencies larger than 0.2 THz. As a result, in the standard set-up, the maximum amplitude of the oscillations drops to zero and there is no evidence of correlations. Remarkably, Benea-Chelmus and colleagues found that they could still observe correlations in their version of the set-up at 4 K. They interpret these signals as a direct signature of correlations in the electric field of the vacuum. The authors achieved this feat because of a sophisticated detection scheme. Based on a branch of research known as nonlinear optics, the scheme simultaneously provides two key components that can be pictured in terms of a modified Mach–Zehnder interferometer (Fig. 1b). 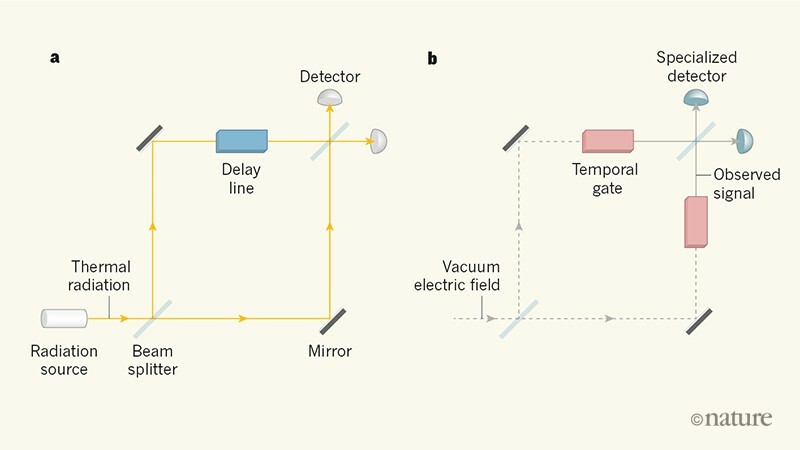 The first is a pair of elements called temporal gates that ‘observe’ electric fields in ultrashort time windows — the two observations differ by a time delay. In Benea-Chelmus and colleagues’ experiment, these gates are implemented by auxiliary ultrashort pulses of near-infrared light that interact with the vacuum in a nonlinear optical crystal. The second is a pair of detectors that are directly sensitive to the electric fields that have passed through the temporal gates and to the correlations in these fields. Benea-Chelmus et al. note that the maximum amplitude of the oscillations, although non-zero, was so small that up to one trillion individual detection events at each value of the time delay were required for the correlations to be discernible from measurement-induced random fluctuations (shot noise). Such a large number of events took about 3 hours at a repetition rate of 80 MHz. An intriguing aspect of the experiment that deserves further investigation is the effect of the detection procedure, including the use of temporal gates, on the measured fields — a phenomenon called quantum back-action7. 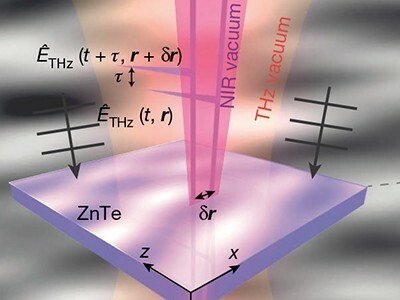 Previous work has described how photons materialize in a vacuum for hypothetical, short-lived observers that, because of the finite speed of light, can access information only from restricted regions of space-time, called space-time diamonds8. By considering multiple observers in such settings, it has been shown that the photons display quantum correlation called entanglement9. The field of quantum optics began with simple experiments that probed amplitude and intensity correlations in optical fields, but now witnesses and applies sophisticated entanglement-based protocols in nascent quantum technologies. Perhaps the authors’ results are the first steps towards ultrafast quantum optics that will one day observe and control the entanglement that lies hidden in the space-time vacuum and in non-trivial ground states of interacting light–matter systems. Riek, C. et al. Science 350, 420–423 (2015). Benea-Chelmus, I.-C., Settembrini, F. F., Scalari, G. & Faist, J. Nature 568, 202–206 (2019). Young, T. Phil. Trans. R. Soc. Lond. 92, 12–48 (1802). Arndt, M. & Hornberger, K. Nature Phys. 10, 271–277 (2014). Ananthaswamy, A. Through Two Doors at Once: The Elegant Experiment That Captures The Enigma of Our Quantum Reality (Dutton, 2018). Grangier, P., Roger, G. & Aspect, A. Europhys. Lett. 1, 173–179 (1986). Braginsky, V. B. & Khalili, F. Y. Quantum Measurement (Cambridge Univ. Press, 1992). Martinetti, P. & Rovelli, C. Class. Quant. Grav. 20, 4919–4931 (2003). Su, D. & Ralph, T. C. Phys. Rev. D 93, 044023 (2016).